Stadion Brügglifeld is the home stadium of Swiss Super League Side FC Aarau and it first opened almost 100 years ago way back in 1924. 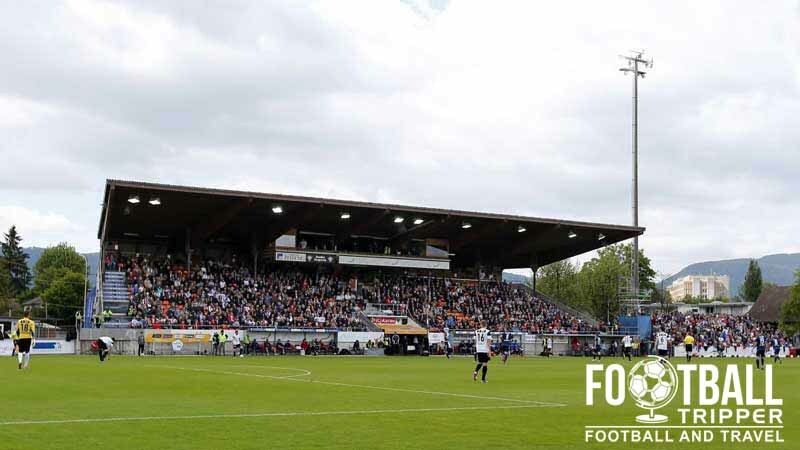 With a current capacity of 9,249 the ground which is located in the city of Aarau is the second smallest in the league heading into the 2014-2015 season. 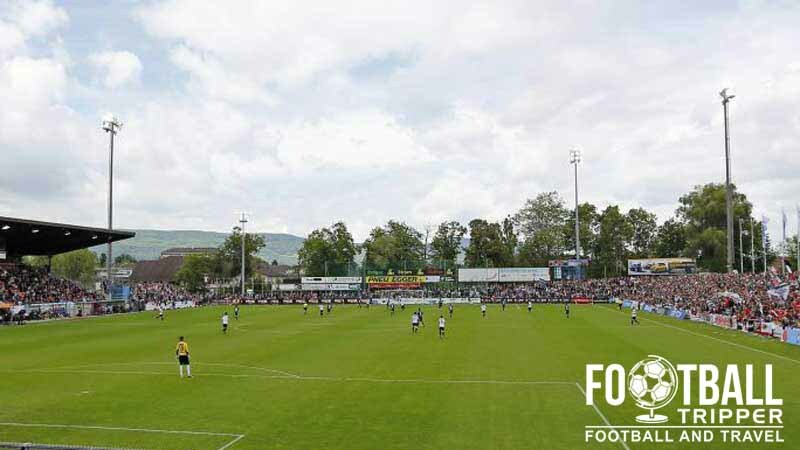 FC Aarau first started playing their home fixtures at Stadion Brügglifeld in 1924 with the inaugural match held against FC Zürich on the 12th October to usher in the club’s new era ahead of the upcoming season. Prior to this, the club played their home matches at Stadion Aarauer Schachen which lacked even the most rudimentary match day facilities. Naturally a massive improvement on the club’s original ground, the club have continued to renovate Brügglifeld over the 20th century with a brand new grandstand added in 1982, followed by a smaller one opposite it a decade later in the 1990s. The ground’s current capacity of 9,249 currently includes just under 1,500 covered seats. There has long been speculation that the club could develop a new stadium since at least 2005 when the Swiss Football Association introduced upgraded safety regulations resulting in the creation of Stockhorn Arena and Swissporarena. However, after plans to move to a new 12,500 capacity ground in the Mittelland Arena were rejected by the local council the club are yet to announce their next move. The issue of locating to a new ground was temporarily shelved when FC Aarau succumbed to relegation in the first division, meaning they were for a while competing in the Challenge League which has different stadium criteria. After winning the division in 2013, the club returned to the Swiss Super League in 2013/2014 and once again found themselves facing the stadium dilemma. Currently construction is expected to start in 2014 with the club moving to a yet-to-be-named ground in 2016. Stadion Brügglifeld is comprised of four stands: North, East, South and West. Away fans are housed within the westernmost corner of the south stand as highlighted on the seating plan above – “Gäste Sektor”. Capable of accommodating up to 1,000 travelling supporters, the away section is accessible from Brügglifeldweg road and tickets cost 21.00 CHF. As there’s no word on a permanent club shop at the stadium you may wish to purchase official merchandise of FC Aarau from the online fanshop instead. 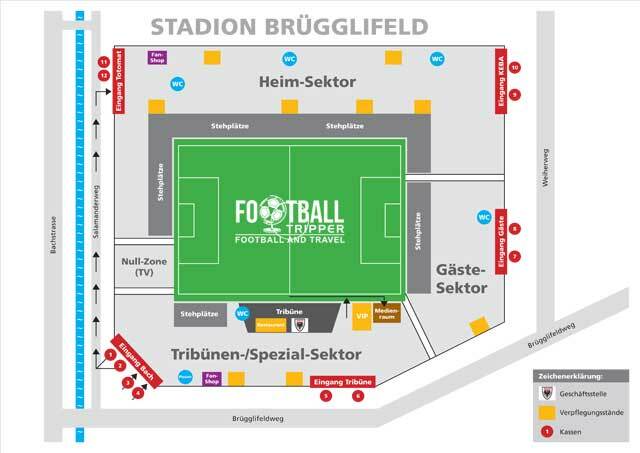 It doesn’t appear as if any tours are available of the facilities at Stadion Brügglifeld. If this ever changes we’ll be sure to update this section. 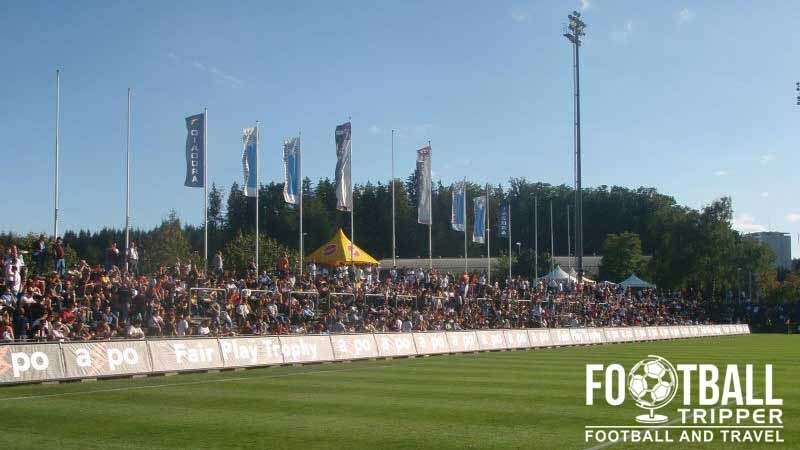 Tickets to see FC Aarau play at Brügglifeld can either be purchased online from the official website or on the day of the match providing that you pay with cash. For adults tickets are priced into two categories depending on whether you’re in the short or long side. A seat in the grandstand will set you back 47.00 CHF whereas a place behind the goal is just 21.00 CHF which is pretty reasonably. Stadion Brügglifeld is located less than 1.5 km south of Aarau city centre which is where the railway station is located. The average Football Tripper could easily walk the distance in well under 20 minutes meaning that there isn’t much need for public transport. On-site parking is extremely limited on matchdays with the official website recommended parking at the nearby Kantonsspital (hospital). You could also find a place within the surrounding residential areas providing you adhere to the local parking signs. Aarau Railway Station is well connected to the rest of Switzerland as it sits on the Zürich S-Bahn line and other various regional lines. From Aarau Railway Station you can either catch bus number 5 in the direction of Goldern bus number 7 heading towards Zelgli. Both services depart multiple times per hour and take no more than five and twelve minutes respectively. The bus stop is known as “Aarau, Keba” and is located on Gönhardweg which is connected to Brügglifeld road which will take you to the stadium in two minutes. The closest International Airport is the one in Zurich which is approximately 51 km east of Aarau along the E60. Upon landing you can catch a high speed rail service known as the S-Bahn line or alternatively a coach. The city centre between the river Aaire and the railway tracks of the train station features the highest concentration of places to stay in the city. Here there is the likes of a Sorell Hotel Argovia, and a Hotel Kettenbrücke AG. If you have a rental car you could also try the Hotel Bären and Hotel zum Kreuz which sit south-west of Stadion Brügglifeld outside Suhr railway station.